In mid-June, Transportation Secretary Ray LaHood, on behalf of the Obama administration, offered a temporary finance plan that, if implemented, could put off legislation to overhaul federal highway and transportation programs. It would also delay a possible vote to raise the national gas tax past the 2010 congressional midterm elections. The proposal came just a day before Rep. Jim Oberstar (D., MN), Chairman of the House Transportation and Infrastructure Committee, released an outline of the legislation – THE SURFACE TRANSPORTATION AUTHORIZATION ACT OF 2009 – aimed at reforming transportation nationally. The current transportation authorization law is set to expire at the end of September. While only an extension is supported by the Administration and the majority of the Senate, the new bill is gaining moment from members of Congress — Republicans and Democrats — and special interest groups, including the Chamber of Commerce. But, Rep. Oberstar’s transportation bill must be heard by the House Ways and Means Committee first — and Healthcare reform, not transportation, is their mandate for the moment. Still, the Minnesotan politician is not backing down. In May, the Secretary of Transportation talked with Blueprint America. BLUEPRINT AMERICA: When people say infrastructure – first of all ‘infrastructure’ their eyes kind of glaze over a little bit. But this is a very important thing – it’s like decisions on whether to put a roof on your house. When you survey the infrastructure in this country, whether it’s roads or bridges – we saw what happened in Minnesota – are we in bad shape? Are we crumbling right now, right as we speak? SEC. RAY LaHOOD: Well, on a positive note, we are the model for the world for the interstate system. When people want to build interstate standard roads, they come to the United States. Now, some of these interstates need a lot of fixing up. And some of that’s going to take place here very quickly as a result of the Recovery Plan that Congress passed. So, we have some issues we have to deal with. We know there’s a lot of bridges around the country that need to be repaired and fixed up. They meet the standards, but they still need to be fixed up. To put it bluntly, currently, America is one big pothole. And everybody knows it. It’s not just in the big cities; it’s all over the countryside. We think the Stimulus Bill and our portion of it – $40 billion – will go a long way to help fixing potholes, fixing roads, fixing bridges and building some new ones, too. BLUEPRINT AMERICA: To what extent when you talk about fixing infrastructure – to what extent are we talking about fixing what we have and to what extent is it time, perhaps, to think about rethinking things? SEC. RAY LaHOOD: Well, it is time to rethink things because moving through Congress is a bill to provide the money for infrastructure and for new ideas for the next five years. It’s called the Authorization Bill, the Highway Bill, traditionally. This is our opportunity right now in the history of building infrastructure to think outside of the box on how we’re going to fund things, how we’re going to move people around communities, how we’re going to move people between communities and whether it’s going to be light rail in communities, buses in communities, bike paths in communities, people walking and opportunities for people to get out of their cars, get out of the congestion and really have opportunities for more livable communities. We’re at a very critical moment in the history of our infrastructure needs in America… And people are thinking about that now. BLUEPRINT AMERICA: Do you really think so? Do you really think Americans are ready to get out of their cars? SEC. RAY LaHOOD: Absolutely. I really do because I think people are fed up in getting stuck in traffic – whether it’s in Washington, DC, or Peoria, Illinois. It’s true everywhere. Because everybody has two or three cars. Everybody has been accustomed to driving two or three cars. And now people are thinking, ‘You know, maybe I could ride my bike to work. Maybe I could get on a bus and ride it.’ People have found that when gasoline prices went up, they got on a bus or they got on a light rail line. They found it comfortable, efficient and cost effective. And, even when gasoline prices went down, people are still getting on buses, trains, light rail and riding their bikes to work. BLUEPRINT AMERICA: To what do you attribute this sea change? Was it the gas price spike we saw and, in my sense at least, is that Americans have a short memory when it comes to gas prices. We did, after all, go through a terrible convulsion in the 70s and we forgot that pretty quickly, didn’t we? SEC. RAY LaHOOD: I think people don’t have short memories to this extent – I think when gasoline prices went up, people did start finding other alternatives and even when gas prices have come down, they’ve stayed with some of those alternatives. And I think they will because of what I said earlier. I think it’s a big headache for most people to get to work, to get to their doctors’ appointment, to get their children to school. It’s a pain. BLUEPRINT AMERICA: Come on, are the soccer moms really going to trade their minivans for a bus? SEC. RAY LaHOOD: I think there are a lot of people that are thinking about different ways of doing these things. I really do. BLUEPRINT AMERICA: We are really good road builders, aren’t we? SEC. RAY LaHOOD: We are… state of the art. We’re the model for the interstate system. We’re not the model for high speed trains because we haven’t done it. And we’re not the model for other modes. Even though Amtrak ridership went up when gasoline prices went up, it stayed up and Amtrak ridership is still very high – efficient, comfortable and pretty reasonable. BLUEPRINT AMERICA: Yeah. I took the Acela down today. Love it. Love the service. But it’s a very small piece of the very big pie. And a lot of people would say, ‘You know what? This is a big continental country. It’s not really ideally suited for that kind of transportation. SEC. 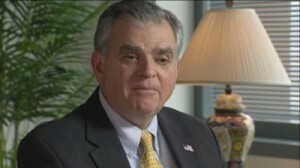 RAY LaHOOD: It’s not bigger than Europe… and look what’s going on in Europe – high speed rail. People get on trains and they can be in one part of Europe to another part of Europe in 90 minutes – going over 200 miles an hour. We’ve never made those investments, but we’re about ready to make those investments. And you go to other cities that still have their streetcars, that still have their buses and you go to some Asian cities and you see people on little motorbikes or riding bicycles. And it works. BLUEPRINT AMERICA: To what extent have your predecessors and the administrations they represented incentivized this car culture that we’re all about, and, in a sense, created the sprawl which is all around us? SEC. RAY LaHOOD: Well, look, if Eisenhower decided to invest all of this money or set the bar very high for developing the interstate system or developing a high speed rail, we’d have high speed rail. They went the other way. They decided we were going to have an interstate system. For whatever reasons. There’s a lot of different reasons for that. And because of that, every subsequent administration, every subsequent Congress, every subsequent DOT secretary has put all their eggs in one basket. This administration is thinking outside the box. The president personally made sure there was $8 billion in the Recovery Plan for high speed rail. More money than we have every had in the history of the department for high speed rail. We are sending out the door $8 billion so people can buy new buses, build bus opportunities for people in communities that have never had them before. So, we’re thinking about transit, we’re thinking about high speed rail more than has ever been thought about before. BLUEPRINT AMERICA: Why do you think we’ve put so many eggs in the car basket, if you will? SEC. RAY LaHOOD: Convenience. People like cars. I think the convenience, the independence that it provides. You don’t have to go by a certain schedule or wait a certain amount of time to do it. But, I think bus companies and transit districts and train operators have learned a lesson from that in terms of really providing convenience and comfort. It’s the convenience and comfort that is the reason that people get in their automobiles. But, there’s a lot of frustration to date with that, too. And all you have to do is drive around Washington or New York or Chicago or even smaller communities and get very frustrated being behind the wheel. BLUEPRINT AMERICA: It’s broken… The infrastructure that we have here – the roads, the system – is it broken? SEC. RAY LaHOOD: There are way too many people in automobiles and there are way too many automobiles. And so it has caused the kind of headaches and heartaches and backaches and every other kind of ache that you can think of for people who are driving around these cities today. And we’re going to change that. This administration is going to change that. Because this is the kind of change that people want. BLUEPRINT AMERICA: Should we pave our way out of this mess? Is it past the time to be thinking about building roads on any sort of grand scale? SEC. RAY LaHOOD: We need to continue to maintain the roads we have, but we need to put a lot of our resources into other alternatives. Like buses, like light rail, like Amtrak, like streetcars, like bike paths. And give people some other options and some other alternatives. BLUEPRINT AMERICA: The thing that impresses me about the car is that the car is the perfect extension of everything that Americans hold dear. We talked about it – independence and freedom and being able to do what you want to do when you want to do it. There’s no substitute for that is there? SEC. RAY LaHOOD: Well, we can create those substitutes, I think. I think we can create them in communities the size of Washington. We can create them in the communities the size of Chicago or New York and we’re about ready to do that. And it’s not just us here in Washington. There are people out in these communities who believe that there should be other modes of transportation other than getting in your car. And the other thing that we should note here is gasoline prices are going to go up. When the economy starts to surge again, a price of a barrel of oil is going to go up and the price of a gallon of gasoline is going to go up. And it’s going to happen. We know these things are cyclical. BLUEPRINT AMERICA: Do you ever listen to Car Talk on the weekends – Click and Clack? SEC. RAY LaHOOD: I don’t. BLUEPRINT AMERICA: Well, when the prices went down, they got on a real rant about, ‘This is the time to raise the tax, because we won’t notice it so much.’ Their point is , we do have – historically – very low gas taxes compared to what they pay in Europe. Is it appropriate to be thinking about raising the gas tax to have it properly pay its due for what it does to the environment, the roads and everything else, and also to fund some of these things you’re talking about? SEC. RAY LaHOOD: Well, we’re not in a mode to raise gasoline taxes. America’s hurting. There’s a lot of people out of work. There’s a lot of people who can’t make their house payment or buy groceries, and raising the gas tax is not an option for us, really. There are other ways that we can do the things we want to do. We can toll roads. You can toll bridges. You can have some private money invested in some of these infrastructure things that we want to do. We’re talking about creating an infrastructure bank that allows you to raise a lot of money without raising taxes. But we’re not going to raise taxes. BLUEPRINT AMERICA: Not going to happen? SEC. RAY LaHOOD: Not going to happen. I assume you’re thinking about a lot of fancy fast trains, connecting big cities. What else do you see if you were to paint your vision for a transportation future for this country? What would it look like? SEC. RAY LaHOOD: Well, I’ll use as an illustration a couple of things. In Miami, they built a lane along 95 and they paid for it by the tolls that are collected for that lane. And that gives them extra capacity on that road. In Houston, they have a light rail that goes from downtown where people – who can’t afford a car, poor people, people that are maybe living paycheck to paycheck and can’t afford to get to the huge medical complex that they have at the other end of town – can get on a light rail system. It’s very efficient, it’s very cost effective. So, what we’re saying is that even if you don’t have an automobile, we ought to develop other options for people to be able to get to the hospital, to get to the doctor, to get to the grocery store. And those options are there. And there’s a way to pay for them. The Infrastructure Bank that I talked about – where you set aside money, it earns interest and that money is dedicated to certain kinds of projects. Public-private partnerships… We need some private investment. There are people out there that are willing to make the price. So, public-private partnerships are another thing that has worked in certain parts of the country. We need to think outside the box other than just the Highway Trust Fund and we simply cannot raise taxes. BLUEPRINT AMERICA: Now, you mentioned Amtrak – how is it different now? SEC. RAY LaHOOD: Amtrak is doing very well. SEC. RAY LaHOOD: But the path forward is very bright for Amtrak. It really is. Their ridership is up. They purchased new equipment. They’re efficient. They’re on time. And they’re pretty cost effective. You can get on an Amtrak train – particularly on the Northeast Corridor and go to any of these cities and it’s pretty cost effective. Amtrak lines in Illinois run from Chicago and deliver students from the suburbs to Western Illinois University, Southern Illinois University – which is a six-hour drive, by the way – to Galesburg, Illinois, where Knox College is. So, these Amtrak lines have really improved. And, they’ve done it because, as ridership has increased, they’ve been able to put money back in to infrastructure, to new cars, to a more comfortable ride for people. Amtrak’s well on its way to becoming, I think, a very, very efficient, comfortable, cost-effective way for people to travel. BLUEPRINT AMERICA: Would you concede, though, that over the years it’s been under-funded and under-supported by the government? SEC. RAY LaHOOD: Congress has really tried to hold Amtrak’s feet to the fire and they’ve gotten the message. And, I congratulate them – for stepping up, improving service, improving efficiency, and really trying to provide the kind of ridership that people now have become accustomed to and that they’re using it. BLUEPRINT AMERICA: So, are you convinced then, that with the right kind of partnership and the right mix, the private sector would jump at the opportunity to get involved in rail projects in this country? SEC. RAY LaHOOD: There’s no question about it. I just met with a group from the West Coast that’s willing to raise 80 percent of the money if we will leverage part of our money to build a high speed rail line from Nevada all the way over to California. They have a plan put together. They know they have to meet all the environmental standards. There is money out there in the private sector – particularly on high speed rail – because the investors know that if you build a good high speed rail, you can make money at it and people will use it. Just the way they’ve done in Europe and in Asia. BLUEPRINT AMERICA: But, they’re so expensive to build. I mean, can you really make a buck doing this? SEC. 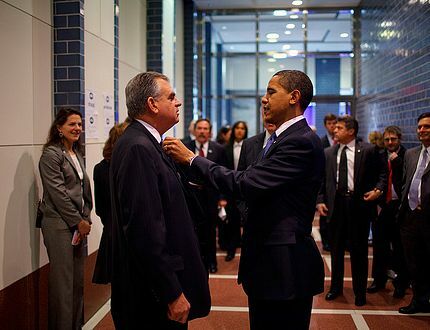 RAY LaHOOD: You absolutely can. And I think that when you look at the European model and you look at the Asian model, they’ve proven that you can have high speed rail – you can do it in a way where the government pays part and the private sector pays part, and you can make money at it. BLUEPRINT AMERICA: That would potentially change the landscape, if there’s money to be made. SEC. RAY LaHOOD: Twenty years from now, you’re going to see at least three or four corridors of high speed rail in America that does not exist today – thanks to the vision of the President and thanks to the vision of people in the country who are willing to make the investments. But, we are right on the cutting edge of having high speed rail in America. BLUEPRINT AMERICA: Where are those corridors? SEC. RAY LaHOOD: The West Coast, the central part of the country, the Midwest, the Northeast Corridor and the South. There’s at least five corridors right now that are in different phases of opportunities to begin. California’s way ahead of the curve. They’ve been planning high speed rail for 20 years. They’ve passed a referendum. They have money sitting in a bank to help leverage some private dollars and to help some of our dollars. And, so, they’re pretty far ahead. The Midwest has got a pretty good plan… So, there are some opportunities in America. BLUEPRINT AMERICA: What about those who say, ‘But wait a minute. We have built a suburban sprawl car-based society here and you’re inserting rail into this picture? And rail is ideally suited for the old cities in the Northeast with the population clusters and centers.’ Does rail really work when you lay that on top of the landscape of sprawl? SEC. RAY LaHOOD: Well, as I said, I was in Houston recently. They have a whole plan for connecting the suburban area with the inner city of Houston, where people can use light rail to come from 10 miles out into the city. There are plans in some of the big cities that enable people to use these light rails. Washington, DC, is a classic example. The Metro system here could not exist if it hadn’t been for the foresight of people who said, ‘We got to get people out of automobiles and into the city to get to work and back to the places where they want to live.’ And this is a pretty classic example of something that has worked pretty well. And other cities are really looking at it. BLUEPRINT AMERICA: We had a nice conversation with the mayor of Portland – obviously, they’re big on streetcars and trolleys there. And those were built very much in spite of the Federal government. I’m not talking about your tenure, of course. We’re talking about your predecessors here. They almost had to fight the government to make this happen. Because the money came just absolutely greased for roads. And basically, they had to build it themselves. What are your comments on that, first of all? Should Washington be dictating – one way or another, whether it’s roads or rail – what localities do? SEC. RAY LaHOOD: Portland’s way ahead of the curve. They are the example of a livable community. They’re the example, and we want to replicate that in other communities around the country. The streetcar system that they’ve developed – we’re going to put some dollars into it. We’re going to be making some announcements. We’re going to be going out there with the folks that have been way futuristic with this. And so, what we’re trying to do is look forward. We’re looking through the windshield, we’re not looking in the rear view mirror. BLUEPRINT AMERICA: Yeah, they’re actually building streetcars there. BLUEPRINT AMERICA: But philosophically, should Washington one way or another be telling localities how to spend their money on transportation? How should that work? SEC. RAY LaHOOD: That’s the old way of doing it. I mean, we do provide a lot of the resources here in Washington. But we know now that we don’t have all the resources and we don’t have all the smart people here. People are going to decide in their communities how they want to get around their communities and we ought to be able to supplement their good ideas and their dreams and their ideas for how they want their communities to look. And I think that is the way forward – I really do.